(Natural News) The media is reporting that a cardiologist who at one time treated former President George H.W. Bush was recently shot dead while riding his bicycle on South Main Street, near Texas Children’s Pavilion for Women in Houston. Dr. Mark Hausknecht, 65, was reportedly biking north-bound on his way to work when the shooter, also riding a bicycle and heading south, brandished a firearm. The man took two shots at Hausknecht, who was pronounced dead not long after, before proceeding onward on his route. The strange incident occurred just before 9 a.m. on July 20, according to Executive Assistant Police Chief Troy Finner. Investigators are still trying to determine whether or not the shooting was intentional, or if it was simply random or prompted by road rage. The suspect, who can be seen in these new photos, is either white or Hispanic, and believe to be about 30 years old. He was seen wearing a khaki-colored baseball cap, short-sleeved blue polo shirt, and khaki shorts. He was carrying a large, fully-loaded, olive green backpack, and was riding a light-colored mountain bike. The Houston Police Department (HPD) recently posted a series of photos to Twitter that depict the man, as well as a composite sketch of his face and video surveillance footage. There’s currently a $5,000 reward being offered for any information that leads to the identification and arrest of the suspect. Some commenters on Twitter have also pointed out that, based on the official composite sketch of the suspect, he may actually be black rather than white or Hispanic. Close-up photos, however, suggest that the suspect has lighter skin. Jim McGrath, a spokesman for George H.W. 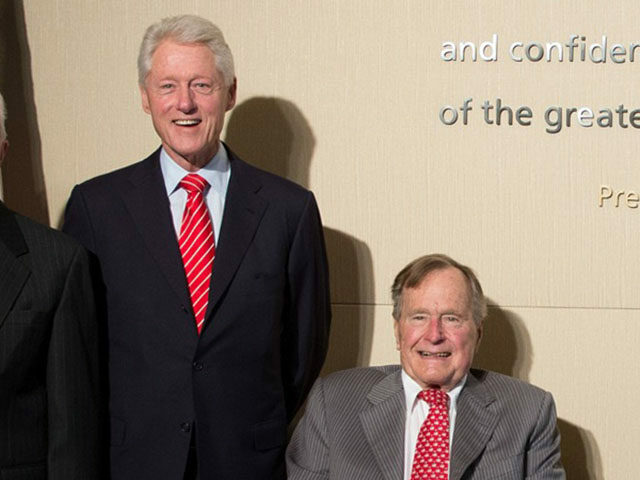 Bush, issued a statement explaining that the former president is “deeply saddened by the tragic circumstances surrounding the untimely passing of Dr. Mark Hausknecht.” He added that “41 sends his most sincere condolences to the Hausknecht family,” as well as to his friends and fellow colleagues at Houston Methodist Hospital where he worked. In his own personal statement, Bush called Dr. Hausknecht “a fantastic cardiologist and a good man.” “I will always be grateful for his exceptional, compassionate care. His family is in our prayers,” Bush added. “When students cannot go to school without fear, and teachers need to arm themselves, what has this country come to? ?” Dr. Hsieh asked in an official statement. “So many have asked what can be done to help. While law enforcement has given you their focus on finding the criminal, I am asking you to use your vote and your voice to stem the tide of this growing public health epidemic. Write, email or tweet your Congressional Representative urging sensible gun laws. We owe it to future generations to leave a safer environment,” she added – because nothing says grieving like turning the death of a loved one into a political action alert. Dr. Hsieh’s canned statement reads a lot like the fake questions that were presented at the CNN “town hall” event in Florida following the Marjory Stoneman Douglas High School shooting.